A fun, nutritious snack food, as is, but feel free to serve with a little nut milk, and enjoyed this as a healthy breakfast cereal. I gave it to W with some almond milk, raw sunflower seeds, goji berries, shredded coconut and a dash of cinnamon. It was amazing! This was an experiment and I don't have exact measurements. There are so many possibilities you can add to this. Be creative! Note: You can try this in your oven, set on lowest temperature and leave door cracked open or open frequently. Keep an eye on it and toss them around every few hours. Rinse, clean, and soak in water for 20 minutes. 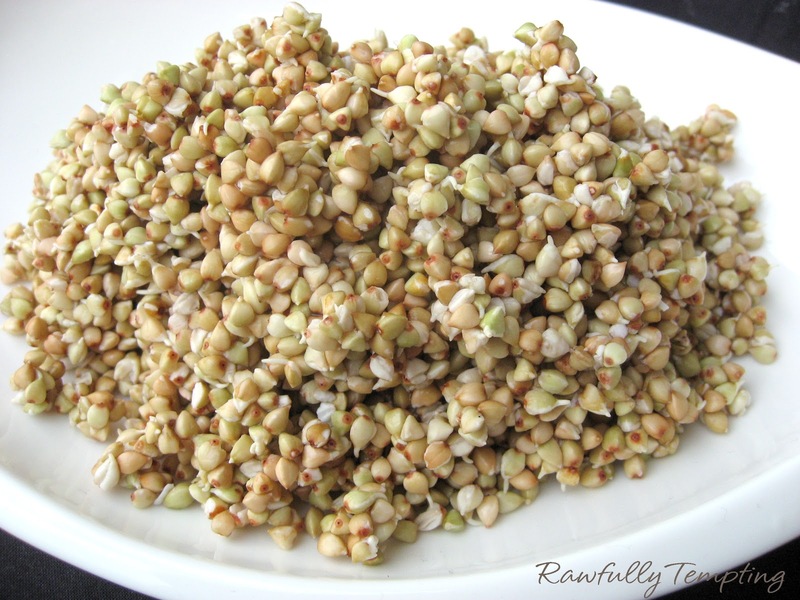 (Buckwheat does not need to soak overnight as it absorbs water quickly and will become rancid if soaked too long). Rinse and drain really well. Return to a wide glass jar and cover with either cheese cloth or mesh sprouter lid. Lay jar sideways or tilt downward, draining into a bowl, away from direct light. Rinse every 6 hours for 24 - 36 hours. (Buckwheat gets slimy so be sure to rinse thoroughly each time, and drain well). These can be used in crackers, breads, salads, etc. Use as is for recipes or dehydrate them (as needed for the above recipe). To dehydrate, - on final rinse, leave sprouts in colander to drain well. Spread on non-stick dehydrator tray and dehydrate over night at 110 degrees until dry. Store dehydrated sprouts in freezer and add to salads or recipes where you want a crunch or grind into flour and use in cookies, breads, and pizza crusts. So glad to have found your blog through the giveaway (and what an awesome giveaway!) --I hope you are doing well. This sounds so yummy, and I love recipes that are easy to vary ingredients in. I don't do well with buckwheat, so I might try with sprouted quinoa or amaranth (which I haven't tried much either, but am thinking of trying this winter and suspect will be easier than buckwheat). Alas, I don't do well with cacao either but fortunately I love carob and also coconut flour! 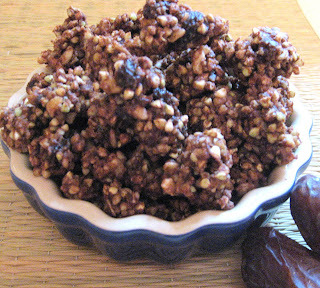 I've made something like this before with cacao and buckwheat. What a great combo! This looks so good! It really tasted yummy in a bowl of almond milk!!! Looks wonderful! 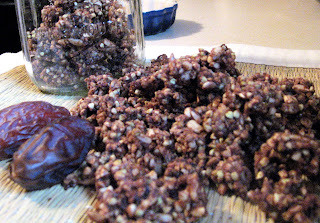 I always have sprouted and dehydrated buckwheat crunchies in the pantry. I will have to try this recipe. What a great blog and recipe. I'm getting lost in your site! Thanks Byn! I'm so glad you are enjoying it! Blessings to you. This looks great and I would love to try it. I was wondering what is the purpose of sprouting? Maybe I can skip that step? Hi @Gergana Kostova! Thanks for stopping by. I'm sure you could make this (and bake this)...however, my goal is to create recipes that are plant based...and as nutritionally dense as possible. Sprouting nuts, seeds and grains add tremendously to the nutritional value. I suppose you could soak..or cook the buckwheat like cereal and then follow the directions...but I've never done it. If you do, please feel free to stop back and let us know. For my non-raw friends, I'd be interested to know how my recipe can be adapted the other way around. Thanks again! I hope you decide to try the sprouting..it's really delicious! Thanks, Barbara! You persuaded me to try sprouting - I am soaking my buckwheat now and I hope it works! Yup, you only need to soak buckwheat for 20 minutes! Big time saver. Please let me know how they turn out. I have a few different recipes for crunchy buckwheat treats...you can store them in freezer, so they are available whenever you need them! Enjoy! The sprouts turned out well and I had your delicious treat for breakfast today. I am no sure how well I did with dehydrating, but the outcome is great! Thanks for sharing! I'm going to try this recipe at the weekend, and I am VERY excited about it. Thank you for the suggestion, I've been looking for interesting and yummy buckwheat recipes & this looks like the best so far!